While often considered and prepared like vegetables, mushrooms are categorized as fungi due to their lack of roots, leaves, flowers, or seeds. According to an article in WHFoods.com, it remains unclear when mushroom cultivation first took place. However, the article discussed that mushroom cultivation might have originated in Asia, specifically in China, India and Japan. Mushrooms are known to prevent the onset of both breast and prostate cancer. The nutritious fungi are exceptionally rich in beta-glucans and linoleic acid. The compounds are found to contain anti-carcinogenic effects that inhibit the growth of cancerous cells and stave off the effects of excessive estrogen. The high selenium content in mushrooms fortifies the liver and helps the organ eliminate cancer-causing compounds from the body. Mushrooms are especially beneficial for patients with diabetes too. The fungi are low in carbohydrates and have virtually zero fats and cholesterol. On the other hand, they are rich in protein and dietary fiber that help improve blood sugar levels. Likewise, mushrooms are natural sources of insulin, a hormone vital to blood sugar control. The natural antibiotics found in mushrooms are touted to protect patients from infections. In addition, the high fiber and potassium content in mushrooms contribute to a better heart health. The potassium in mushrooms provides a vasodilating effect that relieves blood vessel tension and promotes better blood flow. Likewise, the beta-glucans found in mushrooms are known to reduce bad cholesterol levels. The fungi’s stems contain high amounts of beta-glucans. Mushrooms are known to boost satiety and promote weight management too. The dietary fiber in mushrooms prolong satiety and reduce appetite. Previous studies have shown that replacing red meat with mushrooms resulted in significant weight loss in participants. Additionally, mushrooms are notably high in copper, which facilitates nutrient absorption. The fungi’s high iron levels are essential in preventing blood conditions such as anemia. The rich calcium content in mushrooms are known to promote bone health, and prevent the onset of osteoporosis. Furthermore, mushrooms contain a potent antioxidant called ergothioneine, which keeps free radicals at bay and fortifies the immune system. 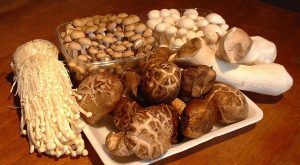 Likewise, the rich selenium supply in mushroom are touted to fend off infection by stimulating the production of killer T-cells. Mushrooms also contain natural antibiotics that suppress microbial growth and staves off other fungal infections. However, experts cautioned that not all species are edible, with some being extremely poisonous. Uncultivated wild mushrooms may contain traces of heavy metals and other toxic chemicals. Mushroom benefit the heart and the circulatory system, the digestive system, and the immune system. Likewise, mushrooms support the brain, bones and the liver. Mushrooms are a popular meat substitute for many vegetarian dishes. An article in BBCGoodFood.com features several recipes that make use of this savory fungi. Mushrooms prevent cancer, heart disease, and diabetes. Mushrooms promote weight loss, bone health, and nutrient absorption. Mushrooms support the heart and the circulatory system, the digestive system, and the immune system. Mushrooms are beneficial to the brain, bones, and the liver.